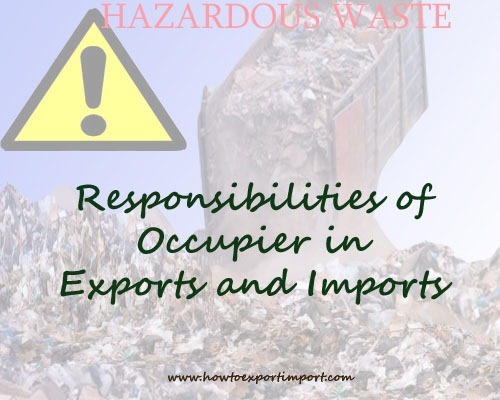 This article mainly gives information about occupier’s responsibilities handling hazardous waste, how does occupier handle hazardous wastes and disposal procedures and storage facilities of hazardous wastes etc. The occupier shall be responsible for safe and environmentally sound handling of hazardous wastes generated in his establishment. The hazardous wastes generated in the establishment of an occupier shall be sent or sold to a recycler or re-processor or re-user registered or authorized under these rules or shall be disposed of in an authorized disposal facility. The hazardous wastes transported from an occupier's establishment to a recycler for recycling or reuse or reprocessing or to an authorized facility for disposal shall be transported in accordance with the provisions of these rules. The occupier or any other person acting on his behalf who intends to get his hazardous wastes treated and disposed of by the operator of a Treatment, Storage and Disposal Facility shall give to the operator of a facility, such information as may be determined by the State Pollution Control Board. It shall be the duty of the occupier and the operator of a facility to take adequate steps while handling hazardous wastes if contain contaminants and prevent accidents and limit their consequences on human and the environment. The occupier should provide persons working on the site with information, training and equipment necessary to ensure their safety. The occupier shall take all adequate steps while handling hazardous wastes to contain contaminants and prevent accidents and limit their consequences on human beings and the environment and provide persons working on the site with the training, equipment and the information necessary to ensure their safety. Would you like to add more information on handling of hazardous wastes materials at the time of importation process? 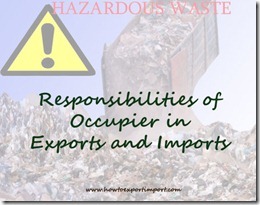 Comment your thoughts below regarding responsibilities and management of hazardous wastes.